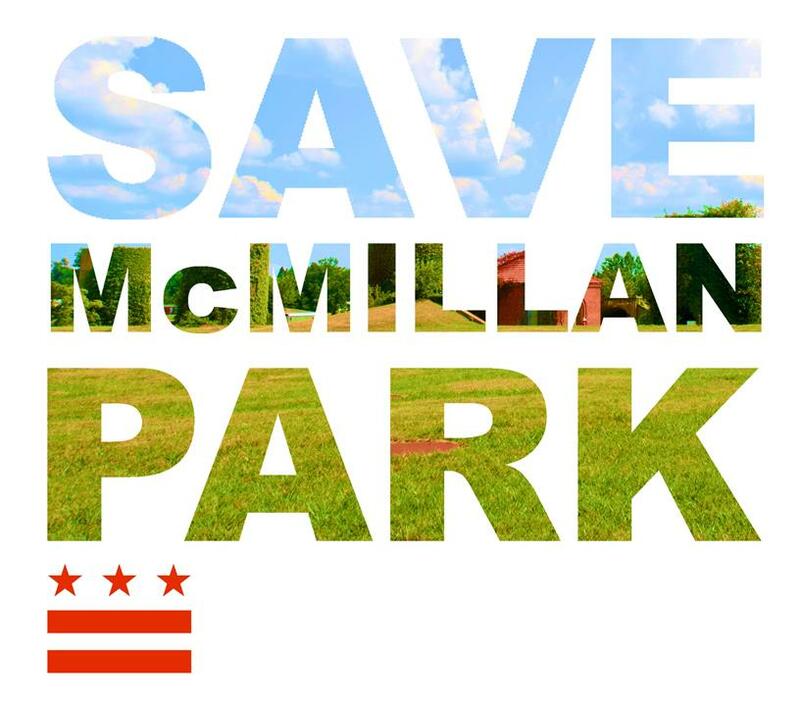 We’ve reached a critical moment in the Gray Administration’s plan to destroy historic landmark McMillan Park and replace it with a plan designed by Vision McMillan Partners (VMP). The DC Historic Preservation Review Board (HPRB) will consider the Mayor’s latest development plans for the Park on October 31st in a public hearing at 10:45 AM. To see the VMP’s new concrete box nightmare, click here. The HPRB helped us slow the Mayor’s relentless push to overdevelop the Park back in June, raising concerns that the development plan fails to preserve the Park’s historic character. We need to flood the HPRB with public comments once more to let the Board know that this concrete monstrosity represents an unacceptable destruction of a historic Olmsted park. Please send your written testimony to HPRB in advance and attend the hearing to testify in person if possible. Below we’ve included a sample email for you to send to HPRB, plus a list of points that you can use to tailor your letter. Help us send the message to the HPRB that this development plan is unacceptable for a Park that is listed on the National Registry of Historic Places—our great city and our historic landmark deserve better! Are you available to testify in person at the HPRB hearing on Thursday? Here’s what you need to know: http://1.usa.gov/19V6wNC. The hearing will take place at 441 4th Street NW, Room 220 South (Metro: Red line, Judiciary Square station). Please bring printed copies of your testimony for the Board if possible. If you have any questions, please contact restoremcmillan@gmail.com or 202.234.0427. I urge the Historic Preservation Review Board to reject Vision McMillan Partners revised master plan, design guidelines, and building designs proposed for McMillan Park Reservoir Historic District (HPA #13-318). The VMP revisions would be a visual blight on the neighborhood. The height, scale, and designs of the proposed buildings are inappropriate for the open McMillan Park site and are inconsistent with the overall character, sense of place, aesthetics, and historic vistas of this distinctive national landmark Olmsted park and engineering marvel. The proposed building designs are also incompatible with the site’s existing historic buildings and with its above- and below-ground historic structures. Specifically, [insert your favorite points from the list of example design weaknesses provided here etc]. Open space is so important to the historic sense of place at McMillan Park that any infill development would be inappropriate. Would you subdivide all the scarce few Olmsted parks left in the District of Columbia? Please reject this application. This entry was posted in Uncategorized by WHY. Bookmark the permalink.